By the month of June a gentle wind ripples through the tall red oat grass, and the only animals easily visible are the slow moving elephants and giraffes, or a lone topi standing on an abandoned termite mound. A stillness sits across the savannah and the lions of the Mara lie in the shade of the acacias, waiting in anticipation. One late morning, small specks rise up through the bushes by Sand River and within minutes become clouds of dust. 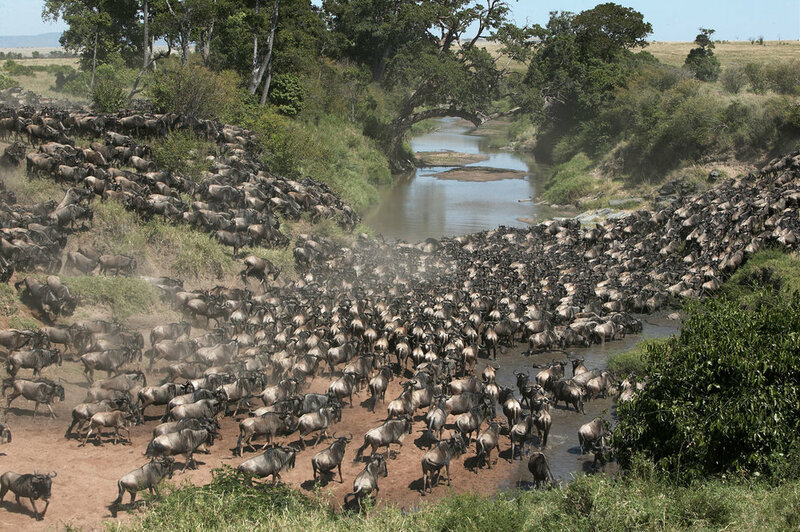 A herd of a few hundred wildebeest swarms its way along and then down the dusty river bank. Some of the herd settles for a few sips of water before the throng returns and takes the thirsty back to the top of the river bank. The migration has arrived. Within a couple of days many herds of thousands of wildebeest are trampling their way through the long grass, snaking their way across to Look-Out Hill and then down to the Mara River. Many visitors only want to see the river crossings but the true spectacle of the migration is 1,245,000 wildebeest, 200,000 Burchell's zebra, 18,000 eland and 500,000 Thomson's Gazelle filling the entire stretch of landscape. The shifting columns of the herds as they traverse the valleys and the hills can only be watched in awe. There is nothing else like this on earth. The migration is a phenomenon that started again in the early 1970s; after a widespread immunization campaign against rinderpest in cattle was there an unexpected disappearance of rinderpest among the buffalo and wildebeest. The wildebeest had, following periodic outbreaks, being kept to around 250,000 animals but following this campaign and an increase in dry season rainfall, the population was able to grow in number and the migration spill over into the Mara. While the migratory population of Serengeti wildebeest has increased, the resident Mara wildebeest have been in steady decline. The Mara population used to migrate from the Loita Plains to the Maasai Mara around the same time as the Serengeti population, but in recent years the herds are staying in the conservancies just outside the reserve as human activities such as agriculture have limited their migratory routes. When is the wildebeest migration season? 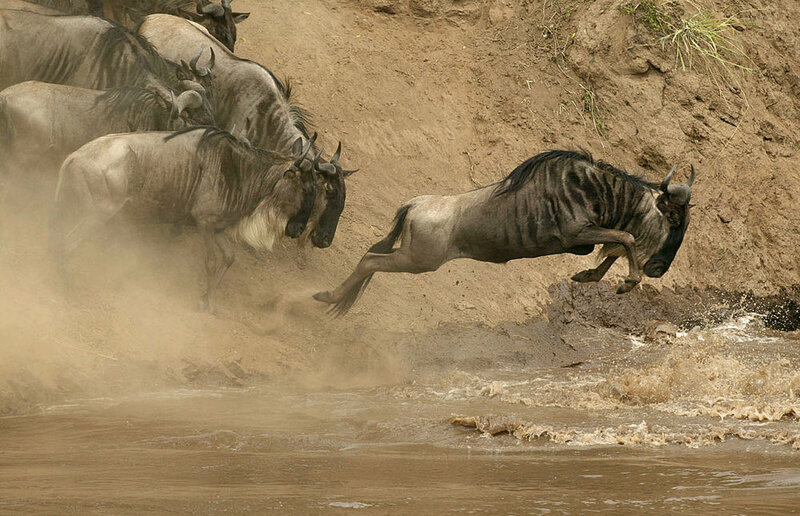 The wildebeest migration usually starts somewhere in June-July and goes on until November. Can I see a crossing during the migration? Crossings happen frequently during the migration but are difficult to predict. If you see a massing of wildebeest along the river and animals seem to be agitated, there is good chance of them crossing the river. How can I watch a wildebeest crossing without harassing them? You should stay inside the vehicle, do not make noise, do not approach the crossing point too close and do not interrupt/block the moving wildebeest. Can I get off the vehicle and photograph the crossing wildebeest? No. You are not allowed to alight your vehicle in the park, unless at designated points. Can I stand on top of my vehicle roof to photograph the crossing wildebeest? No. You are not allowed to do so. Is it okay for me to sit on the vehicle window to do game viewing? No. It is dangerous and is not allowed. Is it okay for me to sit on the vehicle window if I am watching a wildebeest crossing? What happens when we harasse wildebeest during a river crossing? Wildebeest will be skittish and may end up crossing the river in an unfavorable location. We have had crossings when wildebeest have died in their hundreds as result of being pushed by vehicles into crossing in unsuitable locations, usually where the riverbank is too steep for them to climb out. They then trample each other and drown.